The Arenes de Lutèce are not what you would call an architectural highlight. Don’t imagine something impressive like the Colossae in Rome. Yet it’s exiting to pay a visit to one of the most important remains from the Gallo-Roman era. Here we are: kids a playing hide-and-seek, scouts are exploring the terrain, some couples are enjoying the first sunbeams, students are having their first picnic, and a group of man is playing boules. Idyllic? Yes, absolutely. The 2nd-century amphitheatre is actually perfectly hidden and you need an insider's tip – not a lot of tourists come here. You either enter by the park, rue des Arènes, by a long open corridor on rue de Navarre or through a passage on 47, rue Monge. Once you’re in, you’ll find the space surprisingly large. Are the guys hanging out or doing sports here, aware that they are walking on historical ground? Most of them just don’t seem to care. 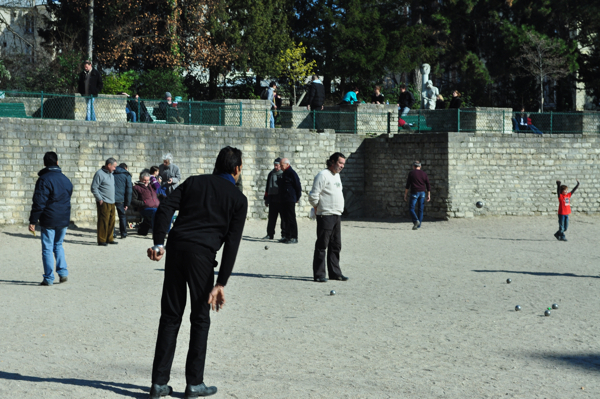 They don’t come to the Arènes for historical reasons. 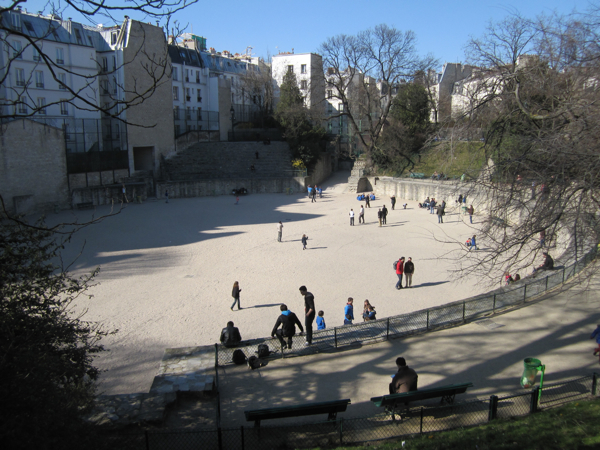 With its park, the Square Capitan just beside, this is just a peaceful place in the middle of Paris. No cars, no tensions, and finally a bit of space. 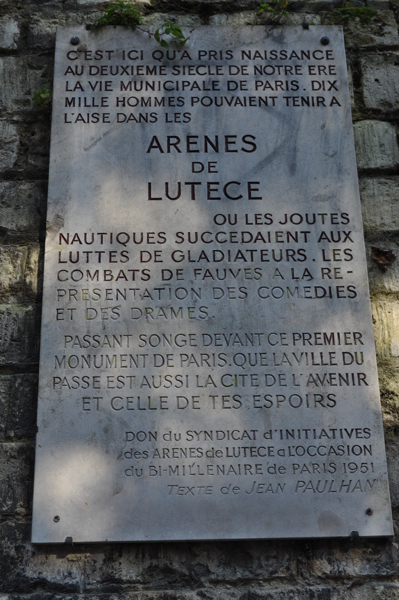 Though for young children in the middle of their Astérix period, a visit to the Arènes des Lutèce is great fun. There is not much left of the Roman amphitheatre apart from a few rows of stone seats. It just needs a bit of imagination to see the hungry lions rushing out of the gates. Back then, 10,000 people could attend the performances. But the amphitheatre was not only used for gladiatorial fights; there was also a stage for theatre plays and other events. When Lutèce was sacked during the barbaric invasionsof 280 A.D, a part of the stone work was used to reinforce the city’s defences around the Ile-de-la-Cité. The Arènes then became a cemetery. They were still visible in the 12th century during the reign of Philippe-August, but then disappeared following the construction of the wall of Philippe August in 1210. Once vanished, people couldn’t tell exactly where the amphitheatre had been situated. It was rediscovered only by chance in 1869. The war of 1870 interrupted the excavations. 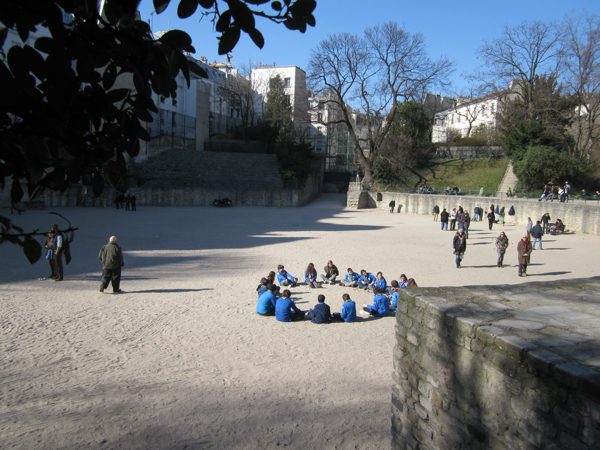 It needed the commitment of writer and poet Victor Hugo to bring the excavations to an end. So enjoy your picnic, open a nice bottle of Bordeaux and drink to Victor Hugo.